First of three stories. Click here for part two and here for part three. NAOMA, W.Va. — A stroke of President Trump's pen earlier this year erased a regulation that took Barack Obama's entire presidency to draft. Flanked in a White House ceremony by coal miners, their bosses and a handful of lawmakers, Trump proclaimed that his repeal of the fledgling Stream Protection Rule would save the coal industry and thousands of jobs. "Special people, special workers, and we're bringing it back," he said to applause. "We're bringing it back fast." Industry and environmentalists battled for almost eight years over the regulation, aimed at protecting waterways from coal mining pollution, and there was celebrating and mourning in Washington over the rule's swift demise. That renewed energy is driving environmentalists like ex-miners Chuck Nelson and Junior Walk into a renewed frenzy. They are bracing for another long fight to protect mountaintops and waterways from strip mining. But with the tradition and promise of coal so ingrained in their neighbors, these activists find themselves literally and figuratively lost in the wilderness. Riding their four-wheelers along a ridgeline above Naoma last month, the two rumbled up to a dirt mound blocking a trail that was wide open several weeks ago. Walk, 26, and Nelson, 61, scrambled up the heap and stared at a cliff of newly exposed rock, earth and coal. "I swear it was a trail," Walk said. "Went straight right here and down through there." Nelson crouched, chin in hand. Walk lit a cigarette in silence. There were seven strip mines on the horizon, all permitted years ago. The two men have seen plenty of mountaintop-removal coal mining. After three decades as a miner, Nelson said he's dedicated his life to ending the dynamiting of mountains to expose coal seams, which fill streams below with debris. Walk works with the local group Coal River Mountain Watch against an industry that he says is poisoning his hometown. Both men knew the mountain beneath their feet would eventually disappear — just not this fast. "Every coal seam around here has already been permitted," Walk said. "It's just a matter of time when they end up getting to it." Hauling away rock at a mountaintop removal coal mine in eastern Kentucky. Photo by Dylan Brown. Under Obama, the industry lay dormant, but with Trump, Walk's sense is that it's "full steam ahead." The U.S. Energy Information Administration has predicted a slight uptick in coal production — 4 percent nationwide this year — and the Bureau of Labor Statistics found 600 coal miners have gone back to work so far under Trump. But Nelson maintains he already sees signs of life for mining here — including more and more young miners in local convenience stores. "You know they just got off work, they're filthy," he said. Huntington Regional Chamber of Commerce President Bill Bissett said it's still too early to tell the extent of the impact Trump's policies could have, but he argued that the president surely ended the chill his predecessor put on coal investment and local morale. "It's hard to quantify, it's hard to be specific about it," said Bissett, who until recently was president of the Kentucky Coal Association. "But I do think something is happening, because I'm seeing coal trains and coal trucks when I'm in southern West Virginia, and I'm talking to people that have coal companies as customers tell me that things are getting better." Without the Stream Protection Rule, the law of the land for protecting waterways in coal country remains the 1983 Stream Buffer Zone Rule. Nelson said even that old standard, like so much of the Surface Mining Control and Reclamation Act, was never enforced adequately by either state or federal enforcement. Now, Nelson said, Trump is stacking the deck for industry. And the environment, he said, will pay "a heavy price." 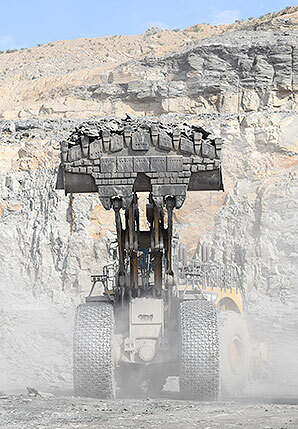 The National Mining Association argues that Trump is simply restoring the balance between mining and mitigation written into the SMCRA. The era of Obama overreach at the federal Office of Surface Mining Reclamation and Enforcement is over, coal's top trade group proclaims. "Our industry is comprehensively regulated," NMA spokesman Luke Popovich said. Whatever feeling comes next — pride or disgust or something else — mountaintop removal is awe-inspiring at first glance, a sandbox of epic proportions. To reach buried coal seams, miles of earth are moved aside, at larger mines by the gargantuan shovels of draglines. Rock is blasted apart by drilling rigs, then scooped into tall trucks to be hauled away. Exposed veins of coal are broken up, pushed into piles and loaded into semitrailers or, depending on the mine, directly onto railroad cars or barges by conveyor belt, bound for power plants. The top of the mountain is piled up into the neighboring valley, or hollow, as it is known in Appalachia. The Middle Ridge mine, an active mountaintop removal coal operation in central West Virginia, in August 2016 and March 2017. Images courtesy of Coal River Mountain Watch. Flattened, the topography left behind — even after reclamation — is irrevocably changed. Whether that is good or bad depends on who is asked, especially when it comes to the Hobet mining complex here, an hour south of the state capital of Charleston. Since she started volunteering with the Ohio Valley Environmental Coalition two decades ago, Vivian Stockman has watched Hobet sprawl over roughly 25 square miles — three-quarters the size of Charleston. West Virginia highlands, she said, became a moonscape before the various companies that have owned the mine coated everything in bright green hydroseed. Spray-on grass replaced more than 60 tree species that ruled some of the world's most diverse temperate forests. "We're looking at mountains turned inside out and left to die," Stockman said. Former West Virginia Gov. Earl Ray Tomblin (D) saw Hobet as an opportunity. He dedicated his last year in office to turning the site into West Virginia's largest industrial park. New Gov. Jim Justice (D), a former coal executive, has picked up the torch of the Rock Creek Development Park, which so far has only a proposed West Virginia National Guard training site as a prospective tenant. Flat land is hard to come by in the Mountain State. Coal companies are supposed to leave landscapes roughly how they found them, but in many cases landowners are eager to turn the sites into grazing land or even a golf course like Twisted Gun in Mingo County. To many people, these developments are better than what came before. "The No. 1 reason people don't come to West Virginia for big projects is they don't have a site," former state Commerce Secretary Keith Burdette recently told The Charleston Gazette-Mail. But the price, Stockman said, is steep, due to another resource that development requires: water. "You've turned the landscape upside down," she said. "You've exposed all that stuff that was locked in and now is leaching out." Coal companies carve rock-lined channels that drain into sediment ponds at the base of every valley fill. There, pollutants are supposed to settle out before water flows downstream. 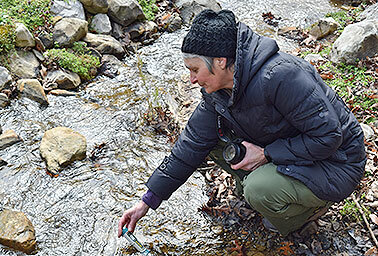 The Ohio Valley Environmental Coalition’s Vivian Stockman measures water quality downstream from the Hobet mine. Photo by Dylan Brown. "It does not work," said Stockman, her conductivity meter dunked into water coming out of a Hobet sediment pond. People downstream are suffering the consequences, said Stockman, who helped collect data for research that connected coal mining pollution directly to elevated rates of cancer and other diseases downstream. 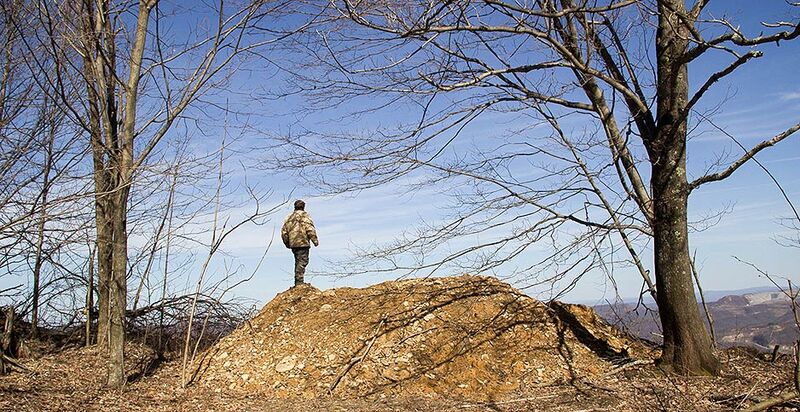 Many people living near mountaintop removal have moved to escape the dust and blasting. "Communities are driven to extinction," Stockman said, and an added consequence is the "cultural extinction" of life in the woods. Those health studies and other science helped motivate the Stream Protection Rule, designed to force companies to restore streams to pre-mining conditions. Stockman cannot help feeling jaded about it. "A regulation and a rule can only be as good as its enforcement, and that has never been even close to good around here," she said. While the revived 1983 rule forbids mining "within 100 feet of a perennial stream or an intermittent stream," coal companies rarely struggled to obtain permit variances from state agencies, federal coal law's primary regulators. At the toe of a valley fill at the Hobet mine, a former stream now dead-ends. "How in the hell could they have a buffer zone or any rule of protection?" Stockman wondered. "It's obliterated." Kentucky Secretary of the Energy and Environment Cabinet Charles Snavely argues the Stream Protection Rule bulldozed the will of states, which is why so many united against it. Snavely, a native of the coal fields of eastern Kentucky, spent 35 years working in the coal industry before Kentucky Gov. Matt Bevin (R) appointed him in 2015. His last job before government service was as president of eastern operations for Arch Coal Inc., former owner of Hobet. Kentucky Energy and Environment Cabinet Secretary Charles Snavely. Photo courtesy of the state of Kentucky. Snavely called OSMRE's outreach "disingenuous," because federal officials reached a final rule that imposed a crippling expense on his agency and near-impossible standard for coal companies to meet. "The health of our economy is ignored in pursuit of this agenda," Snavely said. Companies argue water compliance costs continue to skyrocket but provide little reward for the taxpayers. "We have reached the point of diminishing returns," Snavely said. "These improvements that are being sought are much more minute and come at exponentially greater cost." Existing rules allow for states to grant variances to keep mines open, but the Stream Protection Rule could have rendered up to half of all remaining U.S. coal off-limits for financial reasons, according to industry estimates. Annual federal reports on state oversight routinely acknowledged steady improvement in reclamation and pollution cleanup. And studies drawing a straight line from mountaintop removal to illnesses in nearby communities are fiercely questioned. "They are related to the fact that we're sedentary and we eat too much and we smoke," Snavely said. Overlooking the 9 billion gallons of coal slurry at Brushy Fork, Walks conceded the dangers associated with his smoking habit. But, he said, "this is a poison I choose." With the Trump administration broadcasting the end of the "war on coal," environmentalists are more fearful than ever about mountaintop-removal mining. "If you want to have a war on anything going on here in West Virginia, it's a war on common sense, it's a war on water and it's a war on human health," Stockman said. Making matters worse, she said, is the expansion of natural gas drilling in the region. She said the northern part of the state is already being "devastated by drilling," and she fears this is just the beginning. "The whole state is a giant sacrifice zone for the fossil fuels," Stockman said. Most West Virginians don't see it that way. "It's a source of pride as a state that we've been able to power this country," said Sen. Shelley Moore Capito (R-W.Va.), who has applauded Trump's energy plans at every step. Stockman said lawmakers' attitudes demonstrate that energy companies are calling the shots in Charleston and on Capitol Hill. Still, it's not only the politicians who want more natural resource extraction in the state. 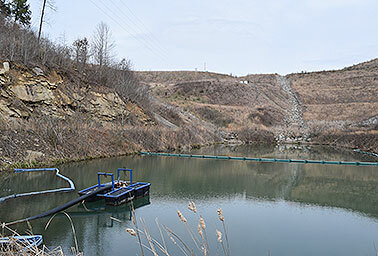 A sediment pond at the Hobet mine site south of Charleston, W.Va. Photo by Dylan Brown. Sheila Warren is the general manager for the Howard Johnson Express hotel in Beckley, W.Va. She said West Virginia needs to extract as much as it can, whether it's coal or gas — or anything else. "We need any source or any type of anything we can do for energy. I mean, if you want to put your windmills, put your windmills. Do what you want to do, but it's all about the money," she said. "West Virginia has to bring coal back. It has to. This state is done, if not," she said. "There's nothing else here." What is West Virginia without coal? And what's the course for opponents in the face of the industry's small resurgence? These are the questions that gnaw at the miners-turned-activists like Nelson and Walk. "We're not going to be collateral damage or expendable people," Nelson said. "We're not going to do that without standing up to people and telling them how we feel." Trump's election, the death of the Stream Protection Rule and the rise of hydraulic fracturing are undoubtedly setbacks for environmentalists, even if they are viewed favorably by people over the next Appalachian mountain. "It's going to be an uphill battle, but here it's always been an uphill battle. We've lost a lot more than we've won here," Walk said. "We gotta keep fighting, because if you stop fighting, you stop living." Tomorrow: How miners became activists.